Ginseng (Ren shen) is the most famous of the Oriental herbs. Known for boosting energy and stamina, it traditionally is said to strengthen the Lungs and Spleen and improve the digestive system. Research has shown that it speeds the transmission of nerve impulses, increases endurance, and strengthens conditioned reflexes. It has also been shown to have many anti-stress capabilities. 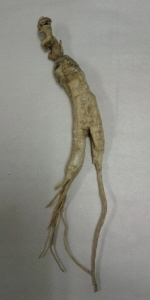 Yi-Sun Ginseng is sold by the root only. These roots are very close in quality and appearance to wild ginseng. The price may vary between $5.95 and $12.50 per gram due to fluctuating market conditions. These roots typically range in weight from 4 to 10 grams. Please call to check on availability and a current price quote. We'll be glad to help you select a fine root. If you want to purchase one, we will reserve it for you. Ginseng can be used alone or combined with herbs such as Antler, Rehmannia, Atractylodis, Schizandra, Astragalus, Paeoniae, or Glycyrrhizae and made into a tea or tonic formula. Size: Sold by individual roots. Picture is an example of how the root will look. Yours may look a little different.